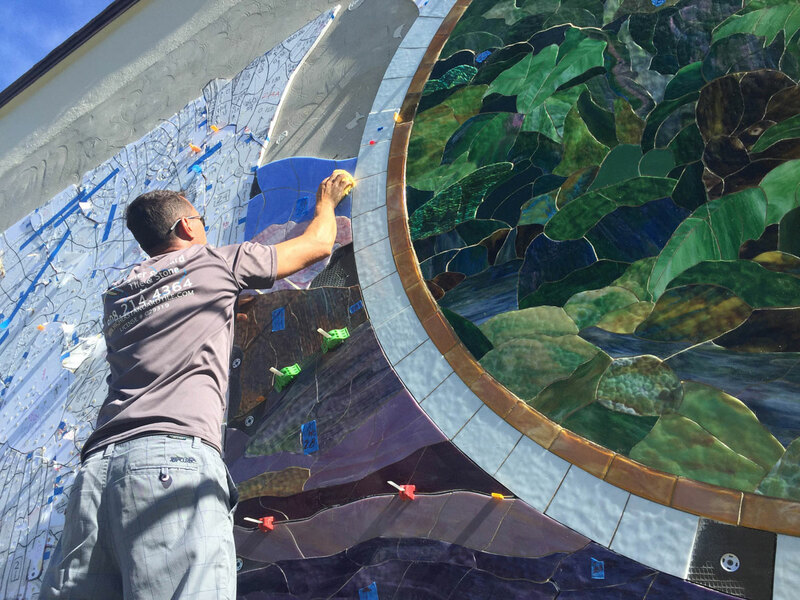 The 52-foot long stained-glass mosaic mural entitled “Na Wao A’O Pi’ilani” (The Life Giving Forests of Maui) was commissioned by the Hawai’i State Foundation on Culture and the Arts as part of its Art in Public Places Collection. 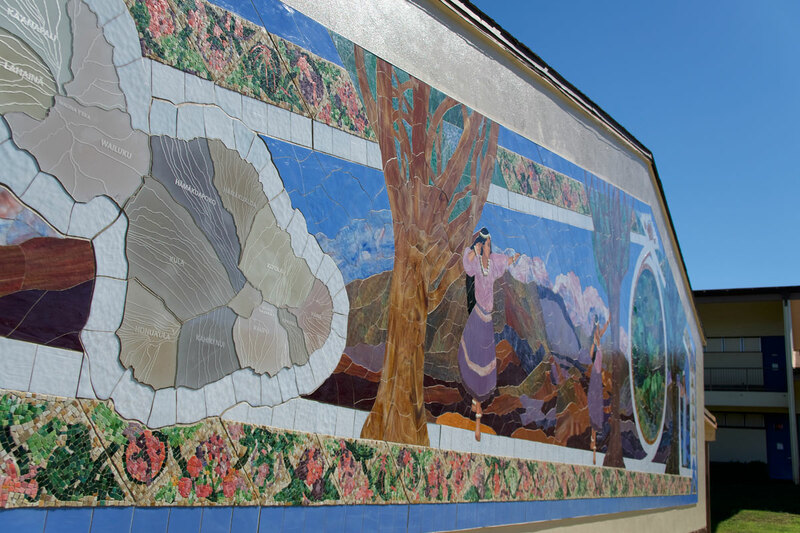 The mural, which was installed on an exterior wall at the school, features an interior mosaic comprised of 3,350 pieces of stained glass and measuring 14 feet tall at its peak. A mural border created with 25,000 smalti glass tiles was worked on by nearly 260 Pukalani community members, including teachers and approximately 185 students in the elementary school’s fourth- and fifth-grade classes. O’Neill and Yoakum, a Waimea-based master stained-glass/mosaic artisan, share a combined 55-plus years of experience in creating stained-glass windows, stained-glass paintings and mosaic murals, skylights and fine art. They previously had created their stained-glass murals following traditional design methods on a concrete substrate. Stained-glass mural pieces would be covered with mosaic tape, lifted up and installed into thinset mortar directly on the wall. 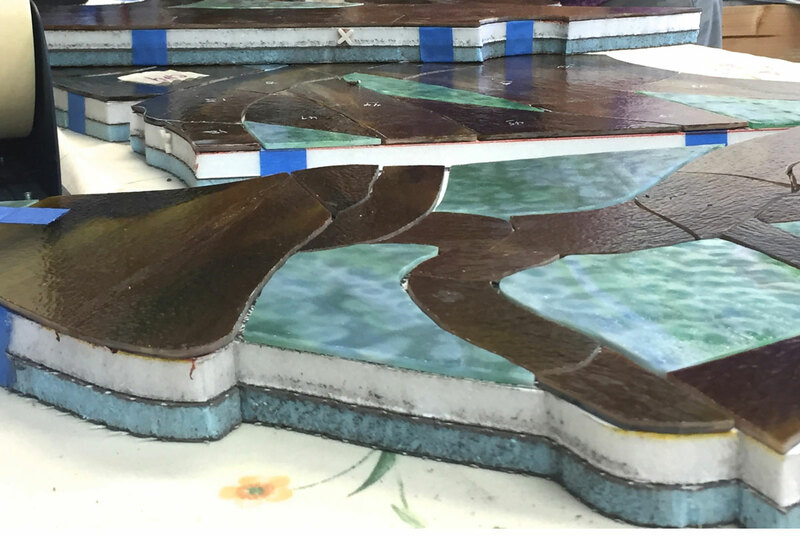 O’Neill wanted to utilize Gatorfoam not only to create the detailed mosaic pattern but to work on with the glass pieces, allowing her to improve detail, accuracy and ease during installation. Additionally, the Gatorfoam was designed to protect the stained glass during shipment by both truck and barge from her studio on the Big Island of Hawaii to Pukalani Elementary School on Maui. “I knew we could develop a fail-proof way of creating, building and installing with Gatorfoam,” said O’Neill. 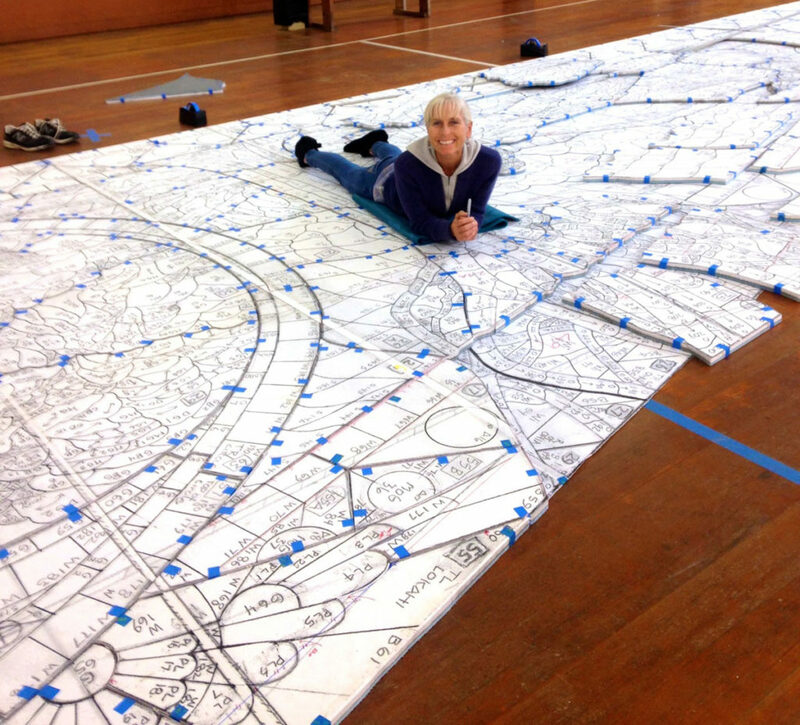 The artist had three full-sized 52-foot long cartoons of her original forest-themed mural master plan printed showing the numbered clear pencil line drawing that she had originally executed at quarter scale on vellum. The first mural cartoon was preserved intact as the blueprint and base pattern upon which to place the mural each time it was fitted on a gym floor. 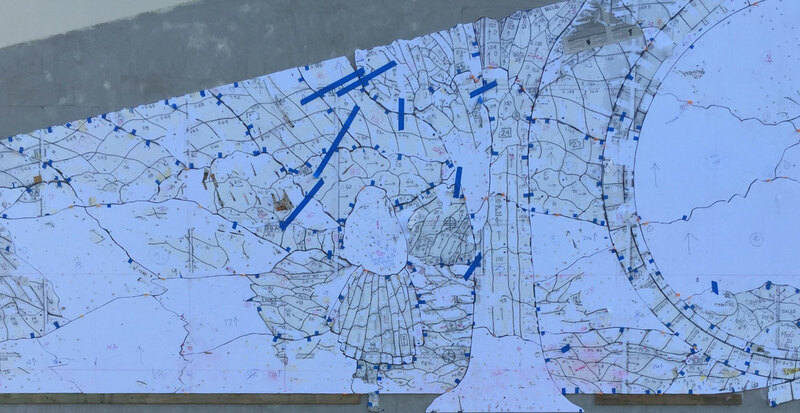 The second mural cartoon was adhered to ½-inch thick white Gatorfoam panels with a temporary adhesive and jigsaw-cut into a giant puzzle of 75 segments that had been sandwiched with lightweight cement-based building panels. An additional 95 Gatorfoam segments were cut for the children’s mural border. All Gatorfoam segments were installed on the school’s exterior wall. The third full-sized cartoon was printed on thin polyester-sheet material and precisely hand-cut with pattern shears into the 3,350 pieces as glass-cutting patterns, leaving 1/8-inch of space between each piece. Each Gatorfoam piece installed on the school’s exterior wall was removed as its matching stained-glass segment adhered to cement-based building panels was set into place with thinset mortar. 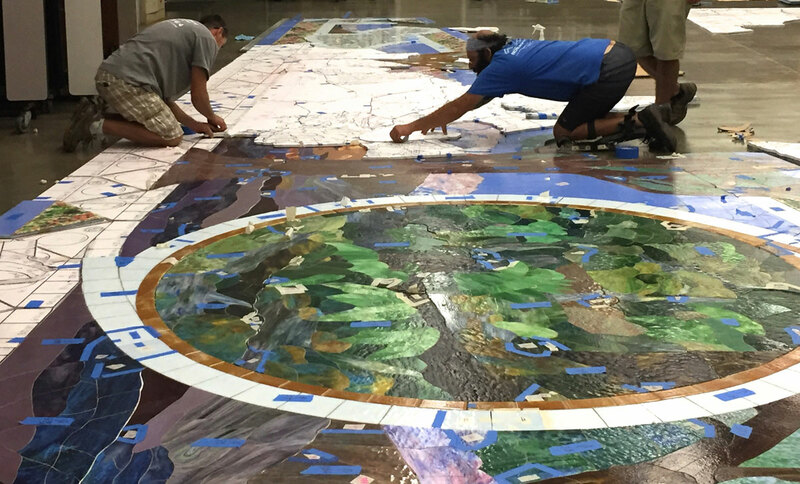 Mural installation was completed in one week by a four-person craftsmen team working under the direction of Isaac Homza from Higher Standard Tile and Stone of Lahaina, Maui, with the artist and her son assisting. O’Neill spent two years in the research, design, full-color cartoon, teaching, organization, materials acquisition and fabrication direction with Yoakum and assistants, as well as participating in the mural’s installation. Reactions of community residents, teachers and students to the installed “Na Wao A’O Pi’ilani” (The Life Giving Forests of Maui) mural at Pukalani Elementary School, have been “wonderfully gratifying,” according to O’Neill, who designed this mural to symbolically reflect old Hawaiians’ ecological practices and to promote the restoration of Hawaii’s native forests today.